Travel to Andros arriving in time for lunch. General orientation lecture, trip safety and plan for week. Nearby island exploration in the afternoon until sun sets. Activities on the water vary from coral reef snorkel trips, excursions out to a mid-ocean buoy in search of silky sharks or exploring the vast creek system. Most days will start with breakfast at 0700-0730 with a short meeting to discuss the plan for the day ahead. Departure 0830-0900, return 1600-18:00, weather and experience dependent. Evening lectures will be offered with photo exchange, coaching and discussion on a variety of topics. Last morning moments to experience a nearby mini adventure, trip wrap-up and return to FLL. Pristine coral reefs and blue holes - snorkel the third largest fringing reef in the world and a 200ft saltwater blue hole in the middle of the sand flats! 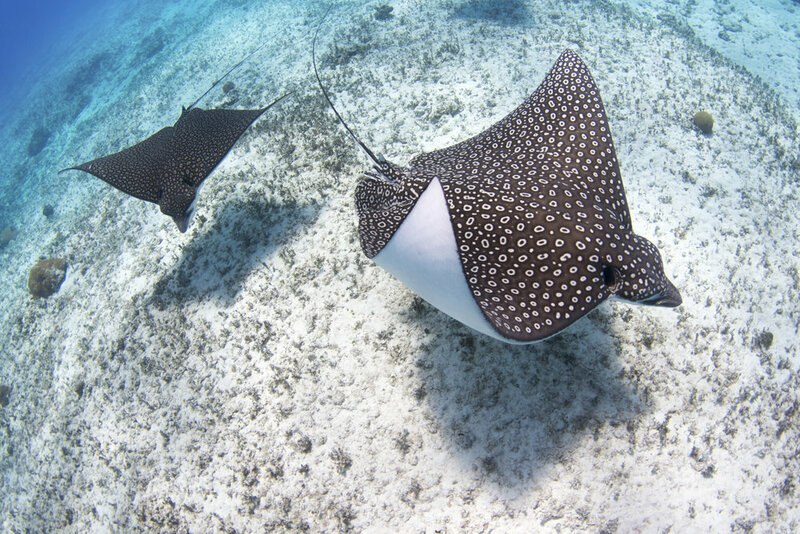 From cruising Caribbean reef, blacknose and sharpnose sharks to gliding eagle rays, resting southern stingrays and schooling reef fish, these trips are not to be underestimated. Expansive mangrove forests, seagrass, sand and mud flats - Andros has a 1.5million acre national park on the west side that is basically an enormous breeding and nursery ground for baby fish, invertebrates, turtles and of course sharks. Baby bull sharks and critically endangered smalltooth sawfish are just a couple of the species that grow up in the vast creek system, who knows what we'll bump into on a day searching the endless flats! Mysterious, deep blue holes exist throughout Andros both inland (freshwater) and out at sea. These bizarre natural occurrences are truly a magnificent site to behold and offer up another habitat for us to explore. Jacques Cousteau visited Andros in the 70s to explore these spooky holes and adventurers and scientists have long been fascinated by the processes that lead to their formation and the alien-like fauna that flourishes in them! A deep oceanic trench that reaches eerie depths of 2000m is just a few kilometres off the reef. It is here where some of the earths greatest pelagic predators reside, from sperm and beaked whales to oceanic whitetips, silky sharks and a host of big game fish! There is nothing more adventurous than exploring the unknown, particularly when it might result in an encounter first for many of us! Shark science – pilot research! Andros Island is unexplored with limited scientific surveys conducted, particularly in regard to its elasmobranch fauna. Our team are collaborating with Dr. Mark Bond from Florida International University to begin surveys on the east side of the middle-bight to study pelagic and coastal sharks and rays. From baited remote video surveillance deployments, to drone surveys and short soak mini-longlines we are excited to learn more about the sharks and rays of Andros. On this first expedition we expect to begin our scientific surveys and hope participants will enjoy seeing the start of this exciting endeavor. Our guests will observe first-hand how methods are setup / established, data is collected, in addition to learning safe capture and processing techniques for various species of sharks and rays. *There are other research topics in discussion that we hope to have more information on by our first expedition in July. Most importantly, Andros is home to the critically endangered smalltooth sawfish (Pristis pectinata), with sightings from new born pups through to large adults in the creeks and back-country. One of our expedition days will be dedicated to searching for this elusive ray. Any sighting, however brief contributes important data, revealing more about this incredible species secrets and hopefully aid in its population recovery. Read Tristan’s paper on the Occurrence and habitat use of the critically endangered smalltooth sawfish Pristis pectinata in the Bahamas. How do sharks perceive the world? To book simply send us an email and we will guide you through the next steps of paying a deposit and securing your spot on the trip. We will ask a few simple questions to gauge your suitability on the planned excursion, along with your compatibility with other guest attendees. We pride ourselves on creating a great atmosphere on our trips, and the team dynamics is crucial in creating memories and moments that we hope will last a lifetime.